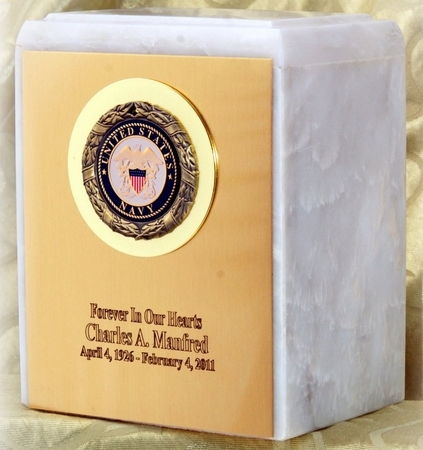 Our Military Niche cremation urn is a full size adult genuine white marble urn is an honorable tribute to your hero. The price includes your choice of medallion and your choice of words on engraved plate. With natural patterns of clouds, veins and swirls it is very distinct in its markings and is offered at this special price. Each piece is unique, different and beautiful. This type of real authentic marble is seen in military cemetaries and landmark buildings throughout the world. This tasteful and discreet urn has a smaller stature so it will fit easily into most crematorium niches. It is one of a kind and is genuine marble. No two are exactly alike but all are beautiful and genuine. EXTERIOR DIMENSIONS are 7" wide x 5" deep x 8.75" tall. FAST FREE SHIPPING! When you place your order you will receive an email within a few hours with your tracking information - we ship the same day you order!